Infant seats. Safety helmets. Crib rails. Seat belts. Immunizations. Hoosier parents strive to keep their babies and young children safe and healthy in the face of hazards both seen and anticipated. But there is a hidden danger from the past that continues to take a toll on the youngest in our state: lead paint. 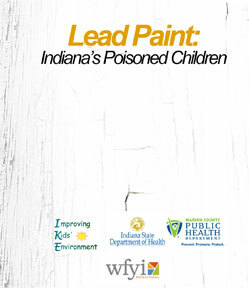 The Centers for Disease Control & Prevention says 13,000 Indiana children suffer from lead poisoning, primarily from ingesting lead paint in their own homes.